It’s SO FLUFFY!! I must’ve said that more than a million times while eating pancakes in Japan. Pancakes are my passion. Well, they aren’t really, to be honest, but I liked the alliteration. I do love pancakes, but if they were truly my passion, I would be eating at a different pancake joint every day in Tokyo. You could totally eat pancakes everyday and not repeat yourself. 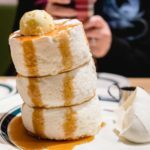 If you’re a pancake connoisseur and you’re looking for where to eat fluffy Japanese pancakes in Tokyo, look no further. There are three big pancake places that everyone seems to visit, and for good reason. If you haven’t seen/eaten Japanese pancakes, you’re in for a treat! They’re fluffy, cloudy, and incredibly light. There are actually many, many kinds of Japanese pancakes. 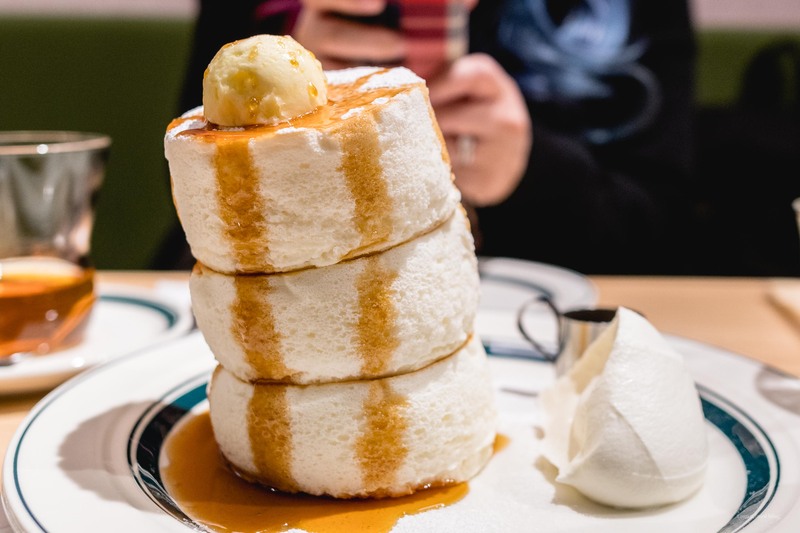 There’s hotto keiki, which are the Japanese version of regular pancakes, but on crack – hotto keiki tend to be tall, thick and fluffy, but slightly on the dense side. There are also many places in Japan that do American style pancakes, which are exactly what you’d think – the pancakes you know and love, topped with fruit, nuts, cornflakes, and the like. There are even cook your own pancake places where you have a hot plate in front of you so you can be the pancake master. But my favorite pancake, and the pancake style that I think you should absolutely eat in Japan, is the soufflé pancake. Light, airy, and oh so fluffy, soufflé pancakes are like eating slightly sweet, melt-in-the-mouth pancake clouds. Here are my top three choices. This was my favorite soufflé pancake of the bunch: three towering jiggling, “how do they defy gravity” pancakes, all stacked up. The perfect texture and sweetness level. Like all pancakes in Tokyo, there’s a bit of a wait if you want to eat these pancakes. Unlike all the other pancake places, Gram has a ticketing system. They serve other types of pancakes as well, but if you want their premium soufflé pancake, you need to score a ticket for a particular seating. They serve the pancakes at 11, 3, and 6 and there are only 20 orders at each seating – the seatings are staggered in 15 minute increments so that even if you get your ticket for 11, they may ask you to come back at 12. Sounds complicated, but really, Mike and I rolled up to the Gram in Harajuku and got the last two pancakes for the 6 o’clock seating. We might have been lucky though. Anyway, these pancakes are the pancakes that jiggle when you shake them! You might think they’re all air and no substance, but they taste delicious and are pretty to boot. After photos, I scooped off the little scoop of butter and ate them mostly plain, with just a smear of the whipped butter, whipped cream, and almost no syrup. The texture is that of a very light angel food cake, but more creamy and less dense, if you can imagine that. A note on how they make their pancakes: it’s clear that Gram uses a mold to shape their pancakes, so the crusts of the pancake are definitely more structured, which helps with the overall height of the pancakes. The inside of the pancakes are on the steamed side because that’s exactly what they do, put a cover over the hot plates when they’re making them. 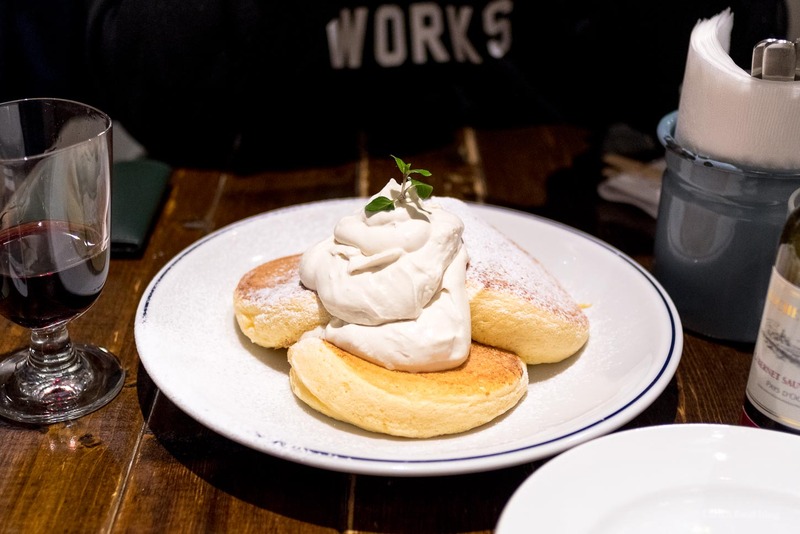 There are three Cafe & Pancake Gram locations in Tokyo: Harajuku, Kichijoji, and Kudanshita. Flippers is owned by the same people who own a bunch of other Japanese hipster food, clothing, and furniture brands. Flippers pancakes happen to be my second favorite pancake in Japan so maybe I should take a closer look at their other food offerings? If you’re looking for fluffy pancakes, go to Flippers. Looking at Flippers menu makes me SO HAPPY. All fluffy pancakes, all the time. You don’t need to go through a strange ordering system here, but you will need to line up, so plan accordingly. Luckily, if you’re going to a Flippers with someone who doesn’t love pancakes, you can promise them a beer when they sit down :) They have lots of different toppings for the fluffy pancakes, but for the sake of science and to ensure fair judgement between the three pancake places, I ordered what they call the “miracle pancake, plain.” Mike ordered beer. These pancakes are not stacked, instead, they come, three on a plate (three seems to be the standard pancake serving), overlapping. If you did try to stack them, it would end badly because these pancakes are even MORE delicate than the pancakes at Gram. They’re made free form style, without a mold as a result, the crusts/edges are softer and the insides are even more delicate. In fact, the pancakes are so delicate that to eat them, they give you two forks so you can fork them apart, carefully, instead of using a knife, which would squish them too much. These guys come with a dusting of powdered sugar, a huge pile of maple whipped cream and no syrup. I may have liked the Gram pancakes best of all, but for ease (because when the pancake craving hits, sometimes you don’t want to do the 20 ticket system), I would line up for Flippers. There are four Flippers Locations in Tokyo: Jiyugaoka, Shimokitazawa, Daikanyama, and Kichijoji. A Happy Pancake hails from Osaka, just like Cafe & Pancake Gram. There must be something about Osakans and pancakes because they know pancakes over there. Anyway, like the pancakes at Flippers, these are made freeform, without a mold and come three to a plate, overlapping. They’re decidedly more yellow than the pancakes at Flippers and Gram and I think they have more egg yolks in them. They have slightly more of an eggy flavor which is why they’re at the bottom of my fluffy pancakes list. But, with that said, if I never had the other two pancakes, these would blow me away. Fluffy and tender and made entirely without baking powder, these guys are amazing. A Happy Pancake uses Hokkaido dairy products and I absolutely loved their honey whipped butter the best out of all of the butters I had. A happy pancake indeed. There are five A Happy Pancakes in Tokyo: Omotesando, Shibuya, Ginza, Ikebukuro, and Kichijoji. 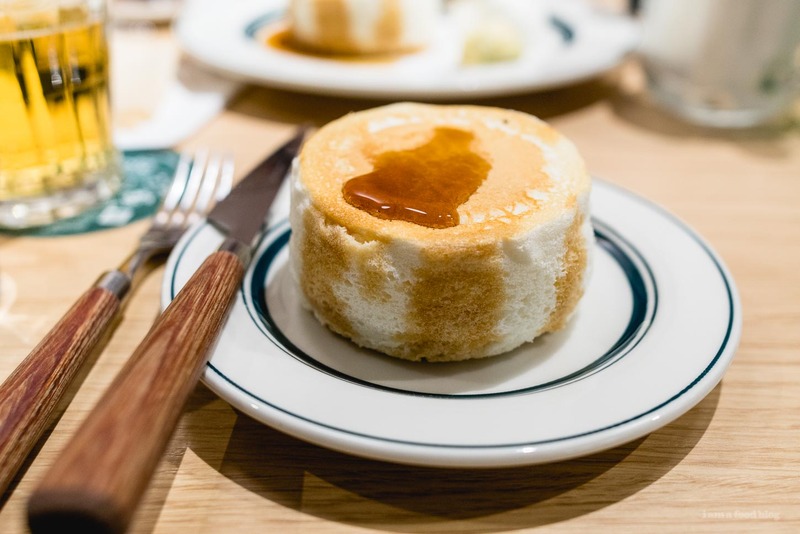 If you are obsessed with fluffy, lighter than air pancakes, have a day where you don’t mind waiting in line, and want to die and go to pancake heaven, head to Kichijoji. Gram, Flippers, and A Happy Pancake all have a location there and you can get your pancake on. Kichijoji also happens to be a very cute area, full of little shops, non-pancake cafes, and generally good stuff, like this bakery that sells Rascal the Raccoon shaped bread. 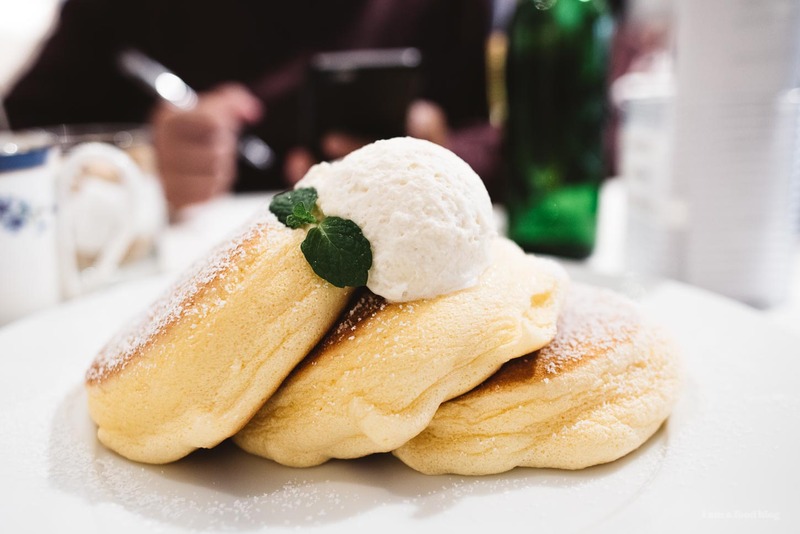 It’s good for a little wander, but don’t spend all your time in pancake cafes – Tokyo has so much to offer! I’m planning to go to Japan in Spring! I’m sure that being vegan I’m missing out on pancakes though I would love to know if they make vegan options because vegans still eat pancakes ! These look incredible! I just had all these pancakes in Tokyo last week. Thanks for all the suggestions. My favourite is actually A Happy Pancake. It literally made me so happy afterwards. It was actually Flippers that was more yellow and very eggy and not A Happy Pancake. I ended up with a stomach ache at Flippers from the egginess so it wasn’t pleasant!